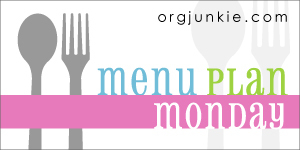 As always, I'm linking up at I'm an Organizing Junkie for this Menu Plan Monday. Chicken noodle soup: I used the linked recipe as a reference mainly. It was SOUP-ER easy and pretty good too. I used chicken broth and a large chicken breast that I already had in the freezer. I added some chopped carrot to up the vegetables and it was perfectly fine. Definitely will make again. Three cheese lasagna: For a lasagna, this wasn't too hard to make. I think my biggest complaint was cutting down the noodles. It seemed like such a waste of food. I may make this again but I'll rework the noodles to make sure there is less wasting them. We enjoyed this and even ate all the leftovers. I hope you are trying to find the WIN in your Monday too!